Provide a local climatology for intensive, short duration field campaigns. Further facilitate regional studies of coastal processes by providing infrastructure that supports easy access to electrical power and data. Provide a reliable system of rugged sensors that allow opportunistic sampling of extreme events. Provide continuous long term (25-30 years) observations for climate studies. Provide a flexible system capable of supporting a wide range of instrumentation and platforms, such as AUV docking stations. Provide a means for public outreach and educational programs. Contribute to a larger network of observatories and platforms for real-time observations that can help verify and improve ocean and atmospheric models. 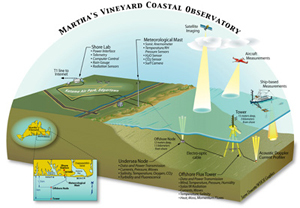 The MVCO includes a small shore lab located between the hangars at Katama Air Park, a 10-m meteorological mast near the South Beach Donnelly House, a subsurface node mounted in 12-m water depth approximately 1.5 km south of Edgartown Great Pond, and an air-sea interaction tower (ASIT) equipped with a top-side node to allow access to air-side or underwater instrumentation at the 15-m isobath. The meteorological and subsea instrumentation are connected directly to the shore lab via a buried electro-optic power cable. The core set of instruments at the meteorological mast measure wind speed and direction, temperature, humidity, precipitation, CO2, solar and IR radiation, momentum, heat, and moisture fluxes. The core oceanographic sensors at the 12-m offshore node measure current profiles, waves, temperature, salinity, and near-bottom wave-orbital and low frequency currents. 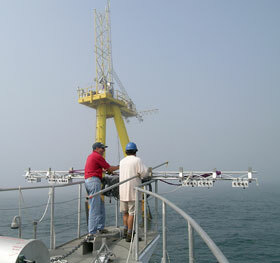 In addition to the core set of instruments, the offshore nodes and the meteorological mast act as “extension cords” into the coastal environment, allowing connection of a wide range of instruments for prolonged deployments.